PostNord Sverige (formerly Posten AB) is the name of the Swedish postal service. The word "posten" means "the post" or "the mail" in Swedish. In 2009 it merged with its Danish equivalent, Post Danmark A/S, forming PostNord AB, a holding company that is jointly owned by the Swedish (60%) and Danish (40%) governments. A rebranding to PostNord for both the mail as well as logistics divisions was performed in 2015. 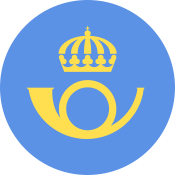 Posten was established as Kungliga Postverket (The Royal Postal Agency) in 1636 by the Lord High Chancellor of Sweden Axel Oxenstierna, who was de facto regent until the young Queen Christina took the throne in 1644. It was operated as a government agency into the 1990s when it was transformed into a government-owned limited company. One of the most visible changes to the postal service was the decision in 2000 to replace Posten's numerous post offices with a franchise net of postal service points, run by grocery shops and petrol stations. Postal Service Centres, run by Posten, are maintained for business clients only. In addition to regular mail, Posten is also the largest distributor in Sweden of advertising mail. Mail and package delivery is seen as very reliable in Sweden, but it has undergone large scale organisational changes and rationalisation in the last decade. Nevertheless, it is under increasing competition from private companies on the Swedish deregulated postal market. Their main competitor is the formerly private company CityMail, nationalised by Norway as of 2006. On 24 June 2009, Posten AB merged with Post Danmark to form the new holding company PostNord AB, owned by the Swedish (60%) and Danish (40%) governments. ↑ "Annual Report 2010 and Sustainability Report" (PDF). Posten Norden AB. 23 February 2011. p. 40. Retrieved 3 April 2011. ↑ "Posten blir PostNord". Retrieved 2015-07-28. ↑ Gustafsson, Eva-Marie. "Turnover Postal and Courier Activities in Sweden". Statistics Sweden, scb.se. Retrieved 13 November 2013.